Stretching: The most immediate way to relieve a cramp is to stretch the muscle. Make sure that you are getting a good warm-up and cool down, which includes stretching after your muscles have been warmed up. Massage: Kneading the muscles increases circulation and can prevent spasms. You can try my version of the "poor mans massage" by using the tennis ball technique or foam rolling. Vitamins & Minerals: Make sure you're getting enough potassium, magnesium and calcium. Bananas, broccoli, spinach, kale, nuts, beans are great foods to prevent cramping. Water: You're probably getting so sick of hearing me say this but there's really no getting around it. 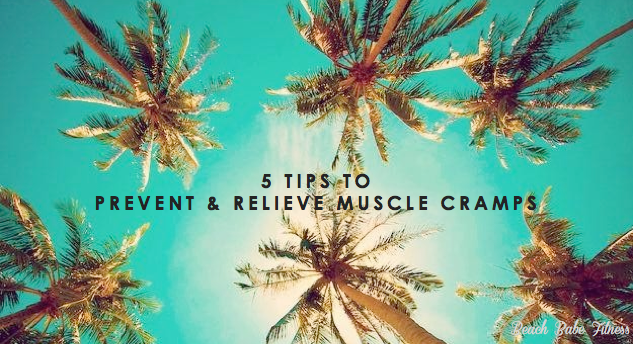 If dehydration is a main cause of muscle cramps, drink up! Toe socks: If you take barre or yoga classes, toe socks (like these ones) can help to improve circulation and alignment in our toes and feet. Also make sure when you're pointing the toe it's not a forced point but more of a natural point in the toe.